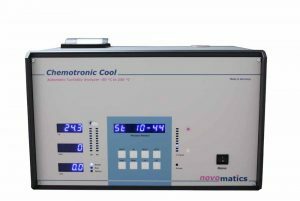 The Chemotronic Cool is designed for measuring the solubility of resins (and polymer blends) by means of cloud point determination over an extended temperature range. The standard Chemotronic III can determine cloud points in the range of +50° to +220° C only, which is generally sufficient for quality control applications. However, in order to use it as a research instrument or to expand the measurable range a wider temperature range and extra features are be advantageous. The ASTM D6038-96 standard describes resin solubility testing by means of cloudpoint determination. This test has been automated by the standard Chemotronic Cool. A 10 % resin-oil solution is dissolved by heating and stirring, and afterwards cooled down to the point at which the resin becomes insoluble, which is called the cloudpoint. The standard Chemotronic III determines cloudpoints in the range of +50 to +230 °C. This is generally enough for quality control applications. All these new features are making the Chemotronic Cool a valuable tool to test highly soluble or high viscosity resin systems. The Chemotronic Cool is recommended by the European working group for standardisation of ink test methods EUROCOMMIT as a preferred method for cloudpoint measurements in research and industry. Extensive round-robin tests have proven the reliability of this test method.